The LitterLocker Fashion is an innovative and hygienic cat litter disposal system. 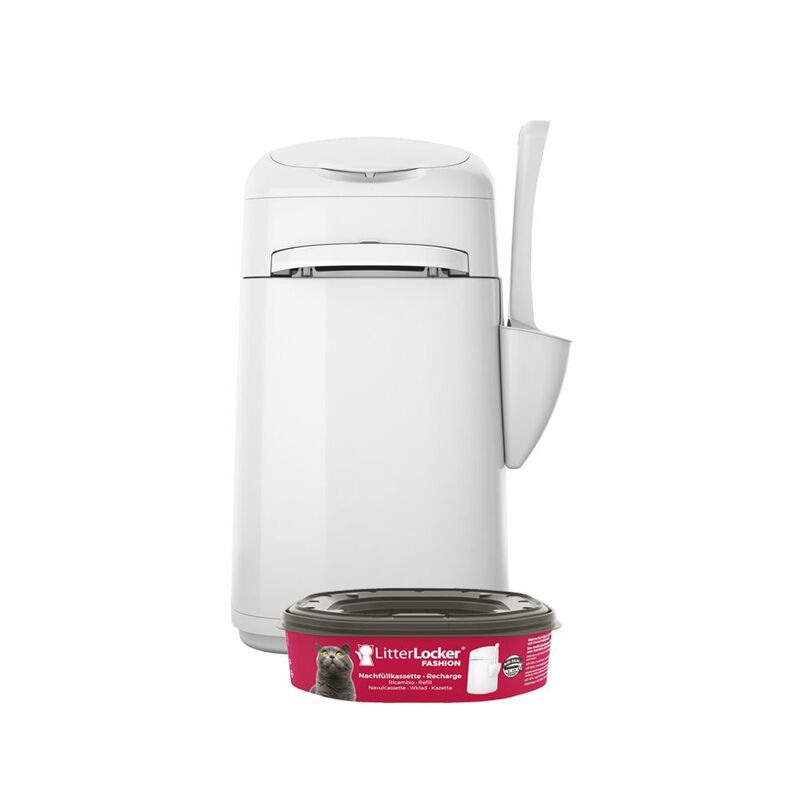 The unique Air Seal technology prevents unpleasant odours from soiled cat litter. It is easy to use, very convenient and you can choose from 5 interchangeable fabric sleeves in modern designs to suit your decor. The secret is in the multi-layer barrier film: The integrated cartridge contains an Air Seal multi-layer plastic film bag. The unique design of the unit with handle closing system ensures that the bag remains airtight once filled with soiled litter, so that there are no bad smells. It hermetically seals in all nasty odours as well as bacteria, leaving your home smelling sweet and fresh. Easy to use, efficient, and time-saving: This attractive bin is the fast, efficient and hygienic way to dispose of cat litter. The innovative Air Seal technology means that the LitterLocker Fashion can hold up to 2 weeks' worth of soiled cat litter (for 1 cat) before you need to empty it. This helps to reduce your trips to the dustbin. There is a handy litter scoop in a holder on the side of the bin and the integrated flap seals the film tube after each use. One cartridge will last for around 2 months for households with one cat. When you need to empty the bin, simply cut the film bag with the integrated, child-safe cutter. Then replace it by pulling and knotting more film from the refill and it is ready for use again. The LitterLocker has rounded corners and a removable lid so it is easy to keep clean. Ring the changes: You can change the look of the LitterLocker with different fabric covers. Choose from 5 different designs and customise the LitterLocker to suit your decor. The elasticated fabric sleeves are interchangeable and are sold separately. Easy to use: Open the lid and throw in the soiled litter. Close the lid and pull the handle. Release the handle to lock in bad odours and bacteria. Easy to empty: Open the cat litter bin. Cut the film bag. Tie a knot in the bag and dispose. LitterLocker Fashion Cat Litter Bin at a glance: Unobtrusive, stylish waste disposal bin for soiled cat litter Reduces trips to the dustbin Hygienic, easy to use, odour-free litter disposal • Large capacity: holds up to 2 weeks' worth of soiled cat litter for 1 cat Includes refill cartidge: 1 cartridge with plastic film lasts approx. 2 months in a single cat household Customise with 5 different fabric sleeves Practical carrying handle: easy to use Closing system handle: guarantees airtight closure of plastic film bag With litter scoop and removable litter scoop holder: for easy cleaning Fully removable lid: for easy cleaning of lid and bin Integrated, child-safe cutter: easy to cut filled bag Modern design, rounded corners Flexible scoop holder: can be attached on either side of the bin Easy to use Easy to empty Colour: white Dimensions: Bin: 24 x 24 x 43 cm (L x W x H) Bin with litter scoop holder: 29 x 24 x 43 cm (L x W x H) Includes: 1 LitterLocker Fashion Cat Litter Bin, 1 litter scoop,. Price just £37.99! Click here to buy now!